Dorothy Parker, Lillian Hellman and the NAACP Writer Dorothy Parker gave her estate -- including proceeds from her papers -- to the NAACP. But literary executor Lillian Hellman made access to Parker's work difficult. Marion Meade tells the story in Bookforum Magazine, and discusses it with Scott Simon. Writer Dorothy Parker gave her estate — including proceeds from her papers — to the NAACP. But literary executor Lillian Hellman made access to Parker's work difficult. Marion Meade tells the story in Bookforum Magazine, and discusses it with Scott Simon. Dorothy Parker died in 1967 at the age of 73. She left no family and directed that her estate and any future royalties go to a man she had never met but admired, The Reverend Martin Luther King; and on his death, to the NAACP. She designated that her friend, the playwright Lillian Hellmann, be her literary executor. But Lillian Hellmann thought that Dr. King was a pompous stuffed shirt, and she didn't think much of the NAACP. Seemingly out of spite, she made it difficult for those who wanted to reprint Dorothy Parker's poems or turn her works into plays and movies. Marion Meade has written about the saga of Dorothy Parker and Lillian Hellmann in the April-May issue of Book Forum magazine. She joins us from our studios in New York. Miss Meade, thanks very much for being with us. Ms. MARION MEADE (Author): Well, thank you. SIMON: First, let us not forget, they were really good pals, weren't they? MS. MEADE: For about 30 years they were best friends, and it was a wonderful friendship, too. But the friendship petered out a little bit, and Hellmann was not quite so interest in being Parker's friend. SIMON: How do you explain Lillian Hellmann's reaction on learning that the estate's going to go to Dr. King and the NAACP? MS. MEADE: She expected the estate to go to her, just as she expected Dashiell Hammet's estate to go to her; these are people who kind of in a way belonged to her. MS. MEADE: Yes, they were never married. And she first met him right around the same time as she met Parker. They were very well-known, and she was basically a 25-year-old nothing. She had never written anything, she'd never published anything; she was simply hanging around in the shadow of men. And I think there was some residual feeling there of, well, you thought you were such hot stuff; I am now the great writer. And look where the two of you are. 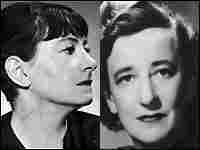 SIMON: Why is it that Lillian Hellmann apparently refused to cooperate with people who wanted to be Dorothy Parker's biographers? MS. MEADE: The first person who came along early was a man named John Keats, and he wrote a biography very quickly after Parker's death, and it wasn't terribly good. And one reason it wasn't good was that Hellmann told all of her friends and all of Parker's friends not to speak to him, he was a newspaperman. And she considered that not good enough for people like herself or Parker. I was the second biographer to come along. I started working on Parker's life in 1980. I contacted her, of course, and of course she didn't respond. So then she died. SIMON: Well, you suggest in the article in Book Forum that Lillian Hellman might have had a personal interest in not giving a scholar the opportunity to delve into Dorothy Parker's life because she, Lillian Hellman, figured into much of it, and Dorothy Parker might have contradicted some of her stories. MS. MEADE: That is exactly right. Lillian Hellmann started to write a series of memoirs about her own life. Unfortunately, these were, a lot of them, fictional. And in the second one of her memoirs, she wrote about a woman named Julia that she had met during the Second World War. MS. MEADE: Yes, yes. It was a very dramatic story and it was made into a film with Jane Fonda. MS. MEADE: Now, on these trips that Hellman described in Pentimento, she wasn't by herself, she was with Dorothy Parker. So she couldn't have very well have ever passed off Julia as a real life story if Parker was alive. And she probably would have had difficulty doing it if there were biographers looking over her shoulder as well. SIMON: You were finishing your biography of Dorothy Parker, called What Fresh Hell Is This, and made quite an interesting discovery. MS. MEADE: It was totally accidental. And I spoke to a lawyer who was Hellmann's lawyer, Paul O'Dwyer, and I said to him, just conversationally, Well, I have one thing left to do before I turn in the manuscript. I'm going to go up to Ardsley, and I'm going to pay my respects to Mrs. Parker. And he said, basically, never mind, I'm looking at her. And he was in his office in Wall Street, and he had her ashes in a drawer right behind his desk. Hellmann gave no indication of what she wanted done with them, and then she died. And so they had stayed there. I think that when I had this conversation with Paul O'Dwyer, he may have been relieved, because he had them there for 15 years. And by that time, Paul O'Dwyer was getting to be a rather elderly gentleman. MS. MEADE: Yes, he was. SIMON: And he decided to honor her. We'll make space here. MS. MEADE: And the NAACP came up with quite a bit of money, I think; at least $10,000, maybe more, to have this memorial garden designed. SIMON: Of course, a lot of her New York friends said, oh, my, but she's in Baltimore. MS. MEADE: I know. Everyone made jokes about that was a fate worse than death. But listen, after you've been hanging around on the shelf when you've been dead for that long, what difference does it really make? SIMON: Yeah. And some nice people took her in, too. SIMON: Marion Meade writes novels and biographies, and she's edited the latest revision of The Portable Dorothy Parker, out last month. To read her Book Forum magazine article about Lillian Hellmann and Dorothy Parker, you can come to our website, NPR.org. Miss Meade, thanks so much.